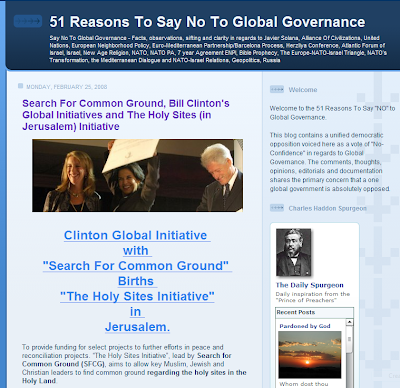 CLINTON PROJECT: "THE HOLY SITES INITIATIVE"
The following information was brought to our attention by one of my linked blogspots: 51 REASONS TO SAY NO TO GLOBAL GOVERNANCE. The ramifications of this project are immense and there will be much more to say about it on all our sites, but I thought you should start looking. I thank "SAY NO TO GLOBAL GOVERNANCE" for timely bringing this to our attention! Funding for the "Holy Sites Initiative"
Objective: To promote religious reconciliation and in particular a lasting Israeli-Palestinian peace. Commitment: To provide funding for select projects to further efforts in peace and reconciliation projects. “The Holy Sites Initiative”, lead by Search for Common Ground (SFCG), aims to allow key Muslim, Jewish and Christian leaders to find common ground regarding the holy sites in the Holy Land.The Holy Sites Initiative will lead to a declaration by religious leaders of the three faiths across the Middle East that formally recognizes and respects the attachments of the faiths to their respective sites. The declaration will include issues of access, preservation, education for mutual respect and a concrete mechanism for dealing with joint concerns. This declaration is to be signed in the presence of world religious leaders at a large international gathering. 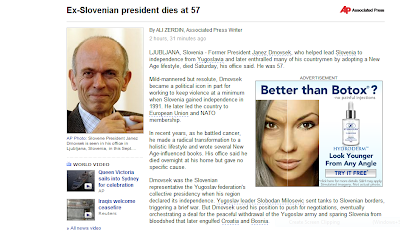 Former Slobenian President dies at 57 ALI ZERDIN, Associated Press Writer1 hour, 44 minutes ago (approximately 8:45 a.m. USA Eastern Standard Time)LJUBLJANA, Slovenia - Former President Janez Drnovsek, who helped lead Slovenia to independence from Yugoslavia and later enthralled many of his countrymen by adopting a New Age lifestyle, died Saturday, his office said. He was 57.Mild-mannered but resolute, Drnovsek became a political icon in part for working to keep violence at a minimum when Slovenia gained independence in 1991. He later led the country to European Union and NATO membership.In recent years, as he battled cancer, he made a radical transformation to a holistic lifestyle and wrote several New Age-influenced books. His office said he died overnight at his home but gave no specific cause.I will be speaking on the Hidden Dangers of that same New Age "rainbow sadly embraced by former Slovenian President Janez Drnovsek on Tuesday night in Walled Lake, Michigan for that local Women's Aglow Chapter. The event is free, open to the public, and refreshments will be served. Hereils are the details which were in my last post as well. On my speaking calendar in Michigan next week . . . I have been asked to speak next week to a Christian group in Walled Lake, Michigan. Details from the organizers are below and I hope to see as many of you as possible there! In the meantime, I thought those of you following Rich of Medford's (Rich Peterson's) very excellent work at his blogspot, "A Time, Times and half a time" would be interested in seeing the number of Google hits yielded with the search terms "Alliance of" (Civilizations OR Civilisations) Lucis." There were precisely 1,260 hits! Click on the picture to see it full page! Our board thought it might be a good idea to advertise your talk on your blog or on the radio. We begin at 7:30 p.m.
Topic: "The New Age and Beyond"
Everyone is looking forward to the information, and, of course,points to focus prayer on. We are covering you in prayer and look forward to this evening. There will be refreshments, however if you will be coming from work and would like something warm for dinner, let us know and it will be therefor you. Sleep well: Javier Solana and Company are Protecting you! Last year, this time, Javier Solana spoke in New York City to the Arthur Burns Foundation, a German-American journalist group. "Dear Javier" was introduced as the "face and voice of Europe" by the German Ambassador to the USA. It appears he celebrated Valentine's Day, once again, not with wife Concepcion, but in New York City, this time to celebrate the opening of a foundation designed to shred, if not obliterate, national sovereignty: "Global Centre for the Responsibility to Protect." But, who's going to protect us from "Dear Javier" and the "Global Centre"? 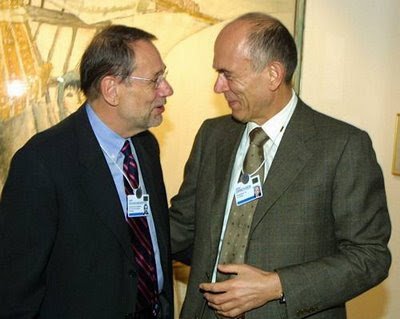 There have been some doubters of Javier Solana's global influence, particularly as he currently appears to be hiding behind upcoming 6 month EU presidency holders such as Nicholas Sarkozy and/or Angela Merkel. 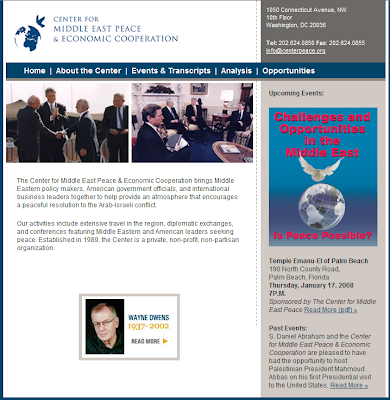 I thought you might want to review this release coming from his own office last March 2007. It was about a global governance speech he had just delivered to launch a new "global governance" project with the enthusiastic cooperation of many powerful people in the USA. Nearly one year later, I wonder how that "global governance" project is coming? Javier SOLANA, EU High Representative for the Common Foreign and Security Policy (CFSP), today delivered an introductory lecture to launch a research initiative on global security at the US think tank the Brookings Institution in Washington. Mr Solana underlined the good relations between the EU and the US. In a broader context, as complex security challenges defy traditional approaches, Mr Solana suggested that, instead of "ad hoc" international cooperation, a universal system to address complex security challenges was needed. NEWS FLASH - NEWS FLASH - NEWS FLASH! VERY, VERY IMPORTANT BREAKING NEWS ON JAVIER SOLANA, ANGELA MERKEL, NICOLAS SARKOZY AND THE BARCELONA PROCESS!!!! "Germany is apparently giving up its stiff opposition to plans by French President Nicolas Sarkozy to press ahead with the creation of the Mediterranean Union. Deputy government spokesman Thomas Steg said in remarks to the press in Berlin that all European Union states agreed that the so-called 'Barcelona process' needed a "new impetus." "Pointing out that the 'Barcelona process' referred to the EU's institutional operation with surrounding Mediterranean countries, Steg called for "reviving the 'Barcelona process'. It's the common conviction within the EU that everyone that wants to join such a process should be able to take part, the chancellery official added. The project has to be open to all EU members, Steg reiterated. Sarkozy plans to unveil the Mediterranean Union in July, coinciding with France's rotating EU presidency. Over the past months, Merkel had repeatedly warned against Sarkozy's unilateral Mediterranean Union initiative, saying all EU member states had to be included in this process. The French president has repeatedly called for such a strategic alliance since winning elections in early May. Sarkozy seeks to include countries like Portugal, Spain, France, Italy, Greece, Cyprus, Malta, Turkey, Lebanon, Israel, Egypt, Libya, in this union. I spent a happy week of my life in the summer of 2006 in the lovely southwestern Oregon town of Cottage Grove. It is also known for a phenomenon that I thought was more common in my home state of Indiana: covered bridges! I was hosted by Tere Lewis and husband Bill. Tere runs a work there called "Living Word Ministries." I met some exceptional fine people, admirers of Tere's work who came from varied places, including a former member of the New York street gang David Wilkerson evangelized in the early days of his ministry. I met a missionary to Finland who was home on Furlough and preparing to go again. He had extensive contacts with the Finnish government. Tere, a former Hispanic nun, has remained on fire for God's work. Cottage Grove is very close to a prominent New Age center town of Eugene, Oregon. It was happy research hunting grounds for me in the Eugene, Oregon town. Another close friend of Tere, Nancy Flint, provided me with invaluable research on disturbing inroads of New Age philosophies in missionary circles. I am still going through her voluminous work and hope to have her as a guest sometime in the near future. Tere Lewis is a good friend and a wonderful and knowledgeable conversationalist. I look forward to hearing from her tomorrow and hope you will join us at 2 p.m. Pacific time, 3 p.m. Mountain time, 4 p.m.. Central time and 5 p.m. Eastern time. We will be discussing, among other things, an award Javier Solana received this week from the Children's United Parliaments of the World. The information is potentially explosive and I hope you will both tune in and stay tuned! didn’t commit . . .
"Andy: Staying on the international theme, you recently attended the Paris meeting of the Eco-Socialist international group, what hopes do you have for that? Tuesday, February 5, 2008 internet radio "My Perspective"
re: fabulous feb. fiveThanks for your nice offer, Constance! Of course I want and the Lord willing, we will have a talk at your "My perspective" next Tuesday,( the feb 5), 5 p.m. Eastern time, USA, 2 p.m. California time, 10 p.m. GB, Portugal and Spain, 11 p.m for the rest of Europe...very much looking forward to it! I continue to be amazed and greatly encouraged at the depth of research on transpiring events of historical, political, and obviously prophetic signficance. I have just, via Farmer's blogspot, discovered the70thweek.blogspot.com.